Put an end to power-cuts and uneven power supply and enjoy a powerful performance without interruptions with the Honda EU2000 generator. The Honda EU2000 utilizes Honda's state of the art technology to provide 2,000 watts of lightweight, quiet and efficient power. So quiet, it operates with less noise than a normal conversation. This makes it ideal for activities that require quiet operation. The Companion has a built in 30-amp receptacle making it easy to connect to a standard model with simple parallel cables for power to run rooftop RV air conditioners and more. This generator will also run up to 15 hours on a single tank of gas when used with the Eco-Throttle feature. 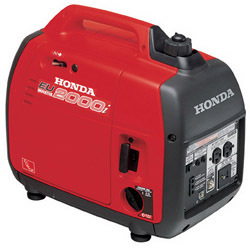 Honda inverter technology makes this generator ideally suited for use with sensitive electronics because the generator produces a clean sine wave of energy that prevents surging. To prevent any possible damage to the unit, the oil alert will shut the unit off when the oil level drops below a safe operating level.